Update: Sensation has been rescheduled. Sensation is coming to India on 6th of February! The World’s Leading Dance Event, Sensation, plans to bring an amazing show to Hyderabad where each guest will be a part of an unforgettable music experience. Acrobats, performers, DJs and tens of thousands of event goers will all contribute their part to this unique dance manifestation. Travelling across 33 nations since the year 2000, the event never creases to amaze, with an all white mandatory dress code, Sensation has united millions of people in the universal language of electronic music experiences. The event will take place at the multipurpose athletic stadium situated in the Gachibowli suburb of Hyderabad which can accommodate a crowd of 40k! A team of 30 engineers work on the design and construction of the show for 5 months. The pyro design includes more than 70 positions from where the pyro will be shot. The show contains more than 800 LED lights, these lights are specially designed for the show and can be controlled individually. Sensation will travel with 10 containers from Amsterdam to India by road and water. The stage is a big carousel with flying horses. The carousel rotates 3 times per minute. The rotating top by itself weights 9 ton (kilo) and turns separately from the DJ booth, they can turn in opposite directions. The carousel contains 12 winches driven by computers. In these winches are hanging 8 dancers and 4 will hang in the arches. Sensation has a center stage, rather than a usual concert setup with an end stage, giving easy access to all fans. Sensation will have more than 130 speakers and subs to give the crowd a best as possible sound experience throughout the venue. It takes over 7 days to build the show with over 100 local crew support. Over 96 moving heads will be installed in between the decoration. The inflatable girls are made of 3000m2 of fabric. The arches are driven by a hydraulic system and will be controlled with a computer. 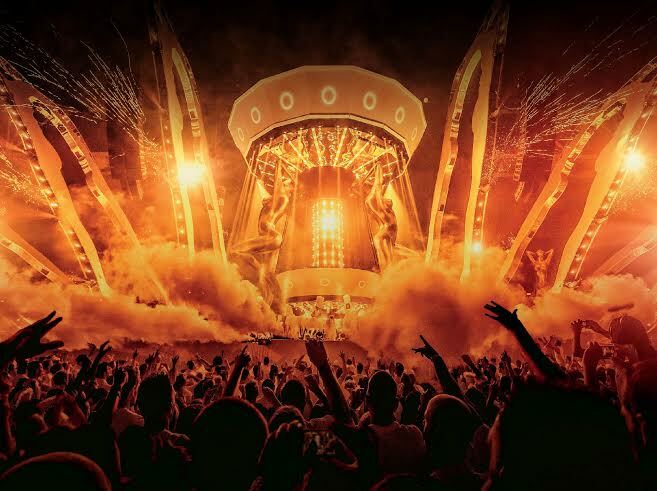 Hyderabad has off late seen a spate of Dance music events headlined by artists like Blasterjaxx, Afrojack, W&W and Armin Van Buuren all thronged by adoring fans & is well connected via a world class airport across domestic as well as international sectors. As Sensation plans to take you to the next level through unbelievable special effects and the groundbreaking stage design with numerous acts from both floor and in the air; this is something India has neither seen nor experienced previously. Stay tuned for more updates on Sensation India! Previous article A night of chills with Vh1 Supersonic Club Nights in Bangalore! Next article Don’t Let Daddy Know Coming to India!